This week, Bug had Tot School at home and on location. Our local Attachment Parenting group put together a rotating tot school where each week, we hold a session at another member’s house. 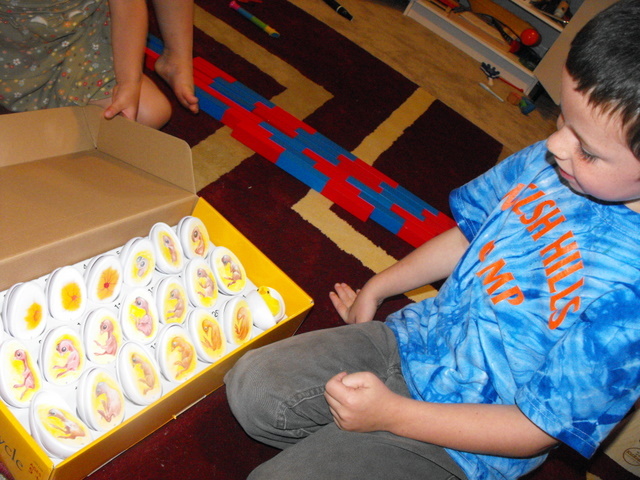 It was so much fun to be able to play with other little tots, as well as explore new ideas for learning! 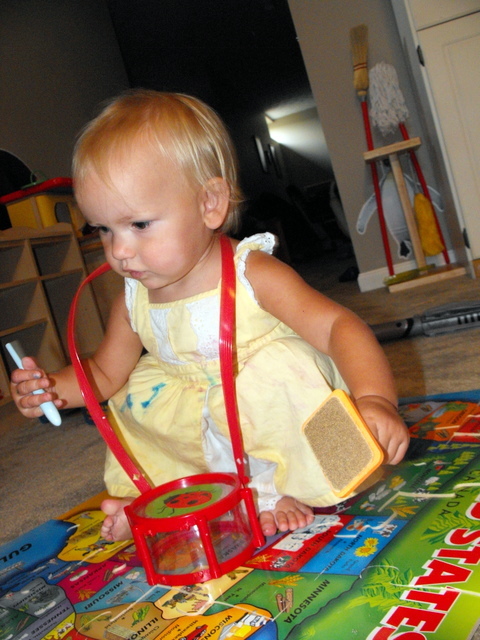 At the travelling Tot School, Bitty Bug really loved a simple homemade game the hostess had made. It was an oatmeal container with a lid on top that had a slit through it that resembled a piggy bank. 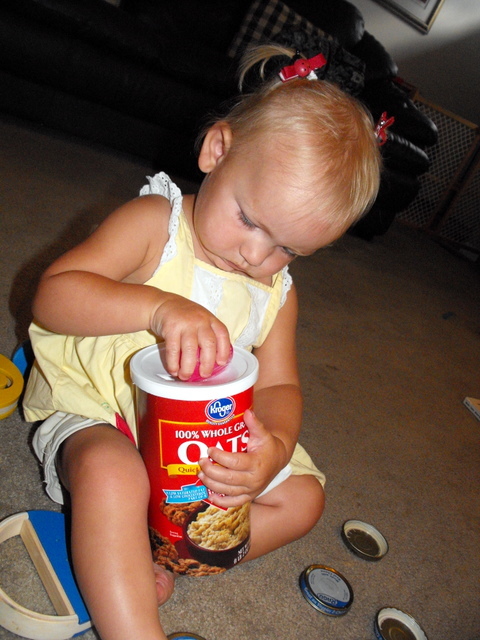 The baby then puts jar lids into the slit, much like putting money in a bank. I have to steal this idea for home-use because Bug really enjoyed it! 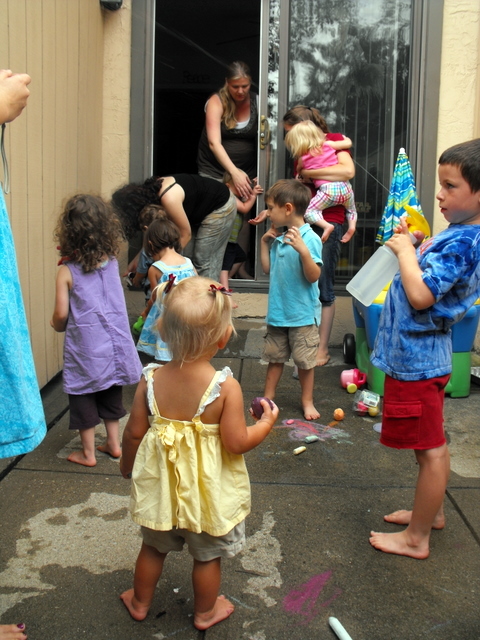 Bug also enjoyed playing outside with the other little ones–especially with sidewalk chalk on the wet patio! 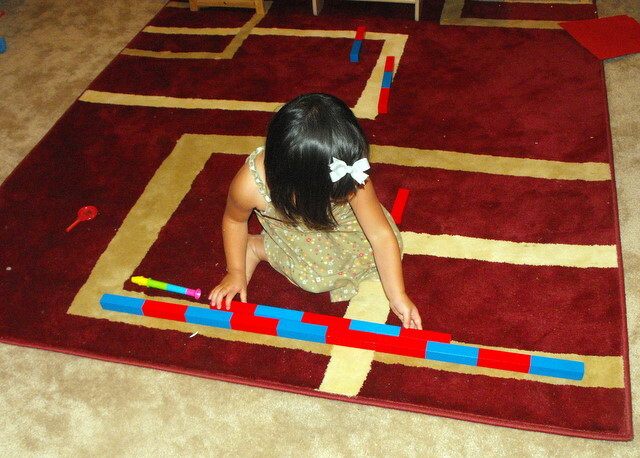 When we got home, we went down to the Montessori room so that Monkey could do her homeschooling. 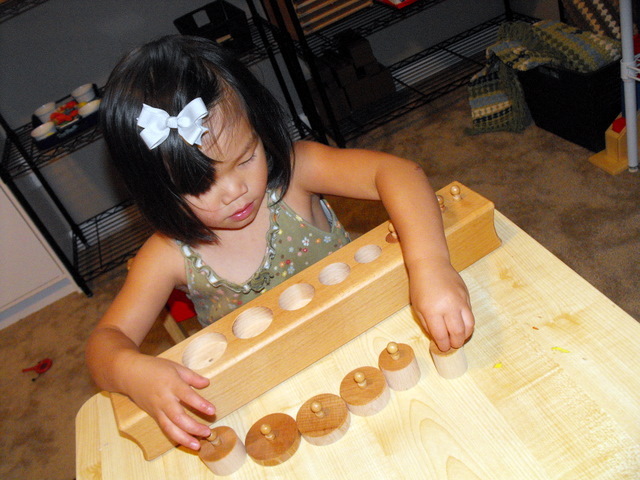 Bug always loves joining in, so we have a special shelf of toddler-aged montessori work set out–which doesn’t really stop her from attempting the preschool work! 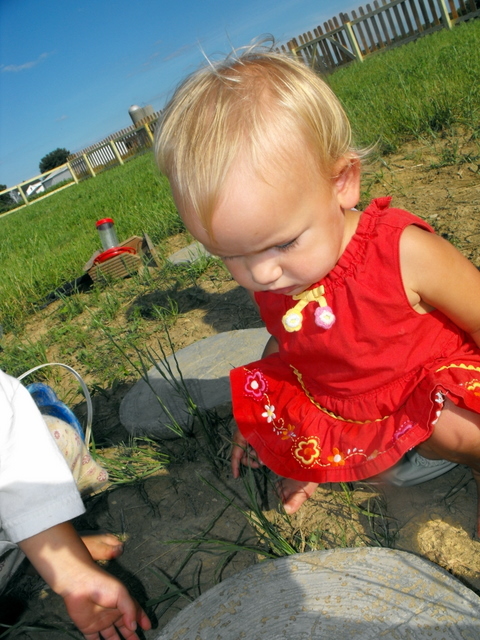 One of her favorite preschool aged work is the rock spooning activity. She sometimes transfers with her hands, but she often does it with the Asian soup spoon. She’s getting really accurate at transferring with a spoon (but she’s also really good at using utensils to eat with as well). Sometimes she gets distracted by the pretty colors of the rocks though, so she stops to look at all of the different colors. Bug also decided to explore the music cabinet today. 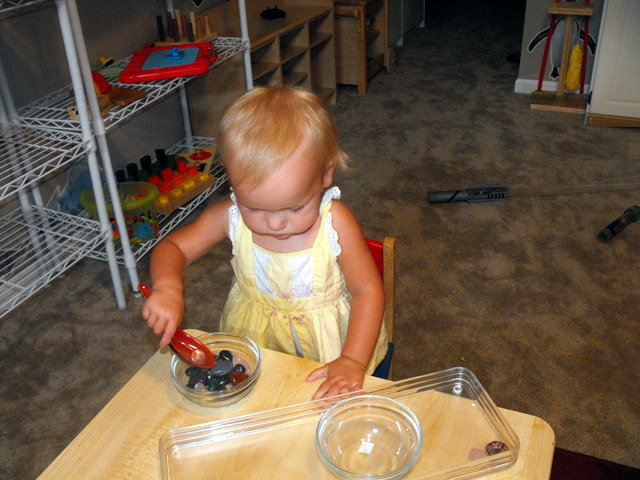 She really enjoyed the little plastic flutes, the shaker toys, and the drums! And as you can tell, sometimes, she attempted to be a one man band with multiple instruments at once! Here she has the stick from the wooden cricket, a drum, and one half of a sandpaper block toy. And last but not least, Bug’s favorite activity as of late is coloring. She will color every minute of the day if you let her (and she’s already broke in our new house by drawing a “mural” all over the living room wall, right before continuing that mural on the couch. Doh. ) 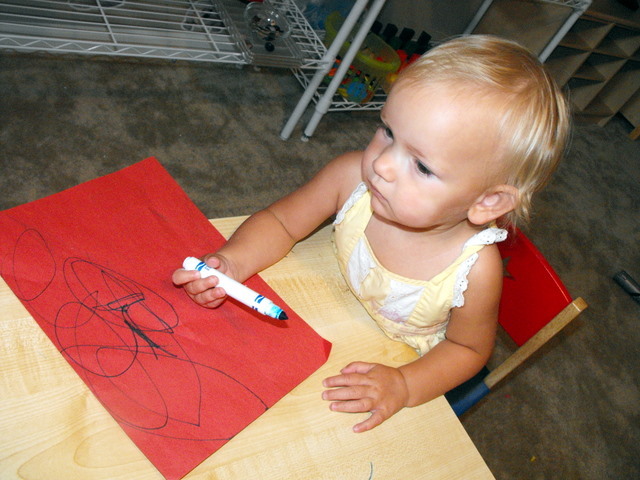 So, usually during tot school times, Bug will dart straight to the art room, grab a marker, and start drawing! Jedi is 6 years 7 months old. Monkey is 3 years 4 months old. Bitty Bug is 17 months old. This past week was fairly busy since Jedi & Monkey both had martial arts camp (for an hour a day each day last week). We took a break from homeschooling so that “life school” could take over. I didn’t want the kids to get worn out! But between martial arts camp, nature studies, and various trips, the kids had a great week. 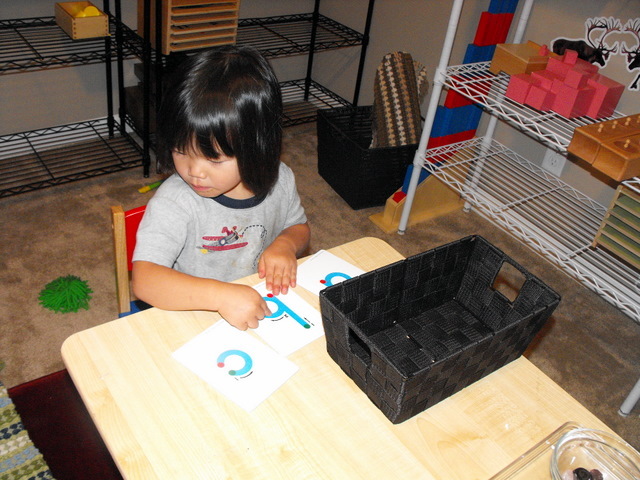 We got back in our Montessori room today, and Monkey seemed to focus on colors a lot today. She’s been really working to try to learn the names–she can match fairly well, but doesn’t seem to be putting the color names with that (but as I mentioned last week, she has some special needs that include language processing issues). We don’t have the red rods because I could only choose one set of rods during our initial purchase, and chose the red & blue ones instead. Today Monkey decided to hold them up and compare sizes…right before she built a train track out of them. LOL! 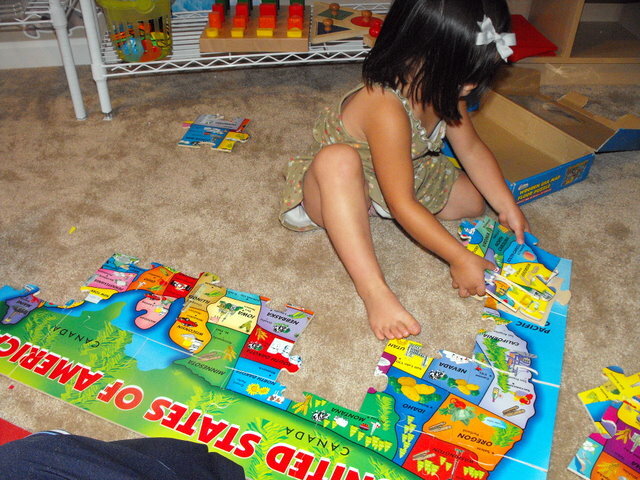 While not Montessori per say, Monkey found our wooden USA floor puzzle on a shelf, and decided that she wanted to put it together, so her and I worked on that together. She’s getting really good at putting together puzzles that “link” verses the puzzles where you just match the piece with the large knob with the pre-shaped hole. 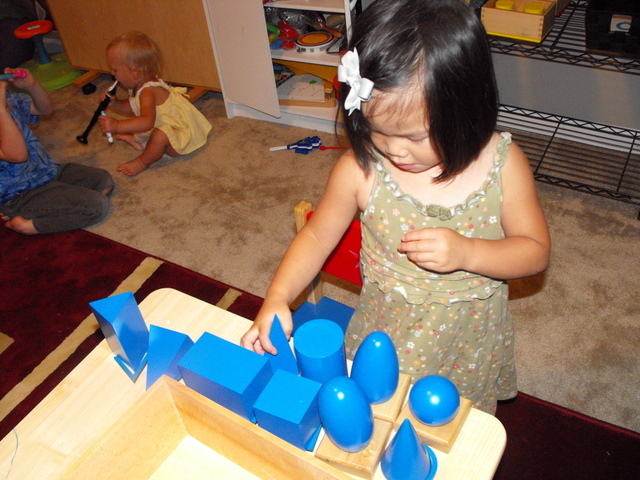 She then chose to explore the geometic solids (we’re not really at the stage where we are naming them or anything…but she found the box on the shelf and wanted to look through it.) 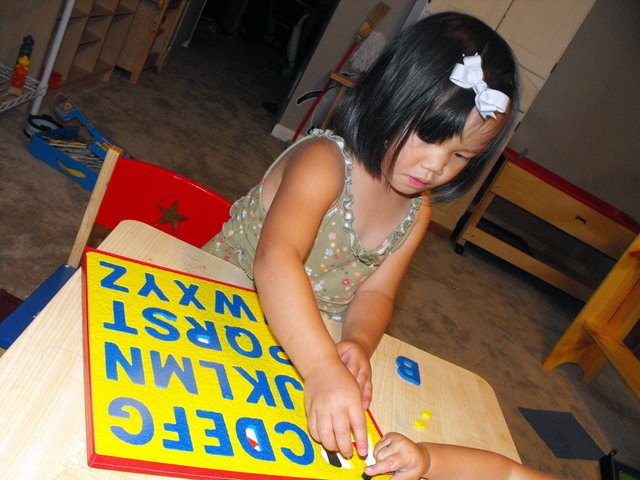 She also worked on the alphabet foam puzzle as well. Jedi found the new science item that I just purchased–I hadn’t gotten a chance to open it yet, so we looked at it together. Since our subdivision doesn’t allow backyard chickens (and because we’re an egg allergic family and raising chickens for eggs probably isn’t a good idea. 😉 ), I bought this set. 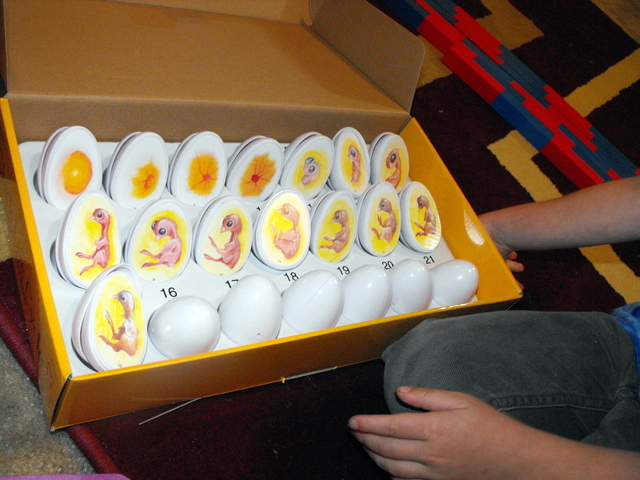 It’s 21 eggs, and when you open them, you see what happens each day of a baby chicken’s development. Jedi thought this was *so* cool! 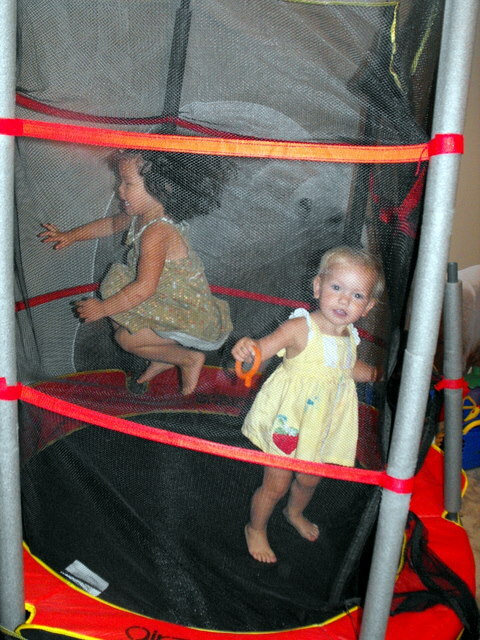 And after all three kids worked hard this afternoon, they decided to blow off a little steam on the mini trampoline. Look at the height on Monkey’s jumps! Today we started the Outdoor Hour nature study for the first time. 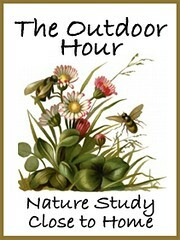 The Outdoor Hour is based on the book The Handbook of Nature Study by Anna Botsford Comstock and is hosted by the Handbook of Nature Study blog. The first challenge for the summer season is on mosquitoes and the sense of smell. To prepare, I read the chapter on mosquitoes out loud to Jedi and Monkey. The book was not really written for very young children (Jedi is 6 1/2 years old, Monkey is 3 years 4 months old, and Bitty Bug is 17 months old), so I had to change the wording a bit so that younger kids could understand. 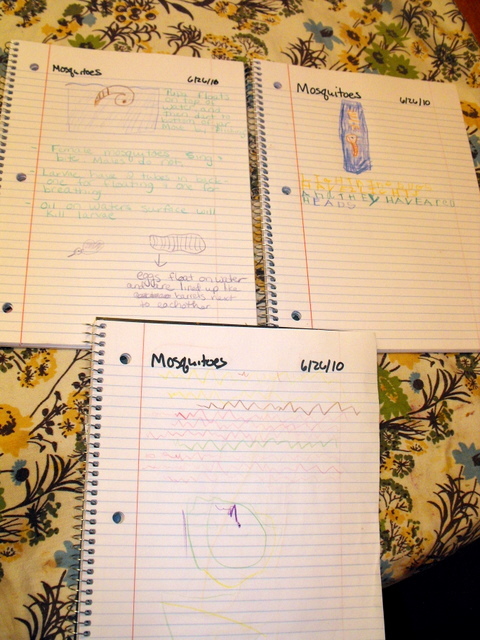 Both of the kids really liked the line drawings in the book, and talked about what they observed about the pictures of the mosquito pupae and larvae. -Pupae have two tubes near the neck: one is a breathing tube, and one has a flap that opens and closes to help the pupae float. 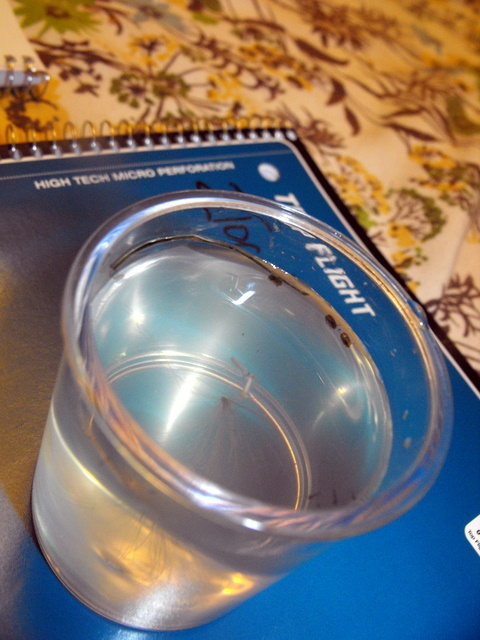 -Mosquito eggs float on the top of water, and are bunched tightly together. 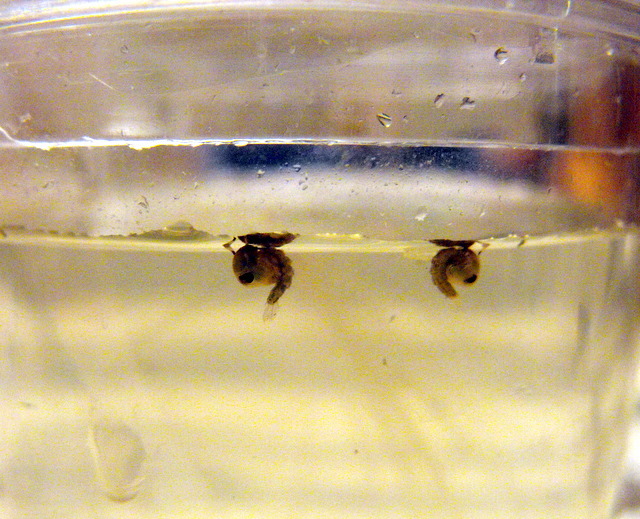 When the larvae hatch, they exit though the bottom of the eggs. -If you put oil on the surface of the water, you will kill the larvae and pupae because of the inability of the breathing tubes to work if coated in oil. -Before learning to fly, the pupae sheds out of it’s skin. It then remains at the surface of the water while attempting to learn to use it’s wings. If a breeze comes while this is happening, the mosquito will likely drown. After we read the chapter, we went outside. 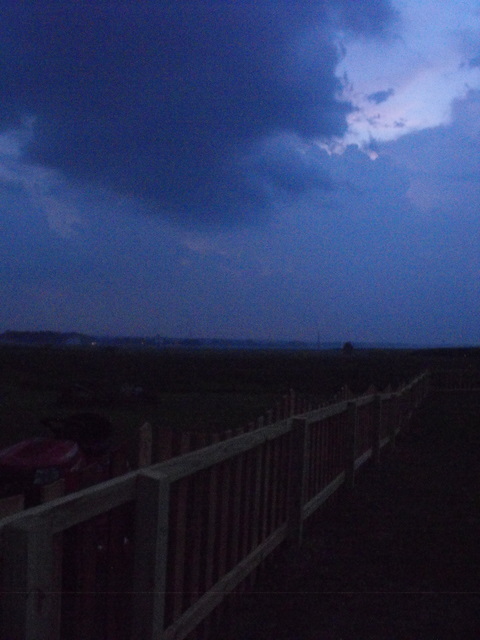 It was just after dusk, and it was about 20 minutes after a brief rainstorm ended (and our observation time ended approximately 30 minutes before a bigger thunderstorm began). 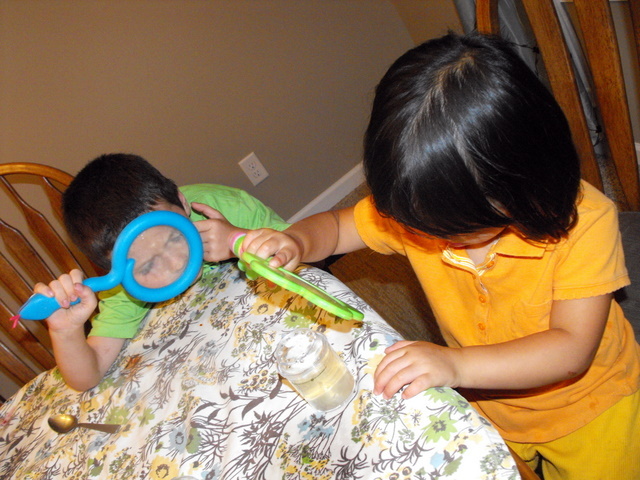 Sight: Both kids noticed a large amount of lightening bugs outside. They also noticed that most of the lightening bugs flew right above the fields surrounding our yard, but not in our yard (which was freshly mowed). Jedi hypothesized that lightening bugs preferred taller grass so that it was easier for the bugs to hide. Smell: Jedi noted that it smelled “like worms” outside. The ground was damp from the storm and it smelled just like a rainstorm. Hearing: While we were outside, we didn’t really hear any insects buzzing, but we could hear faint thunder in the distance. We also heard birds singing and crickets chirping. After the initial senses training, we went to a part of the yard that has been dug out for a small pond. After several recent rainstorms, the hole had filled with water, about 3 foot deep. The water has been there for a couple weeks. The kids sat next to the water and observed bugs skating across the surface. 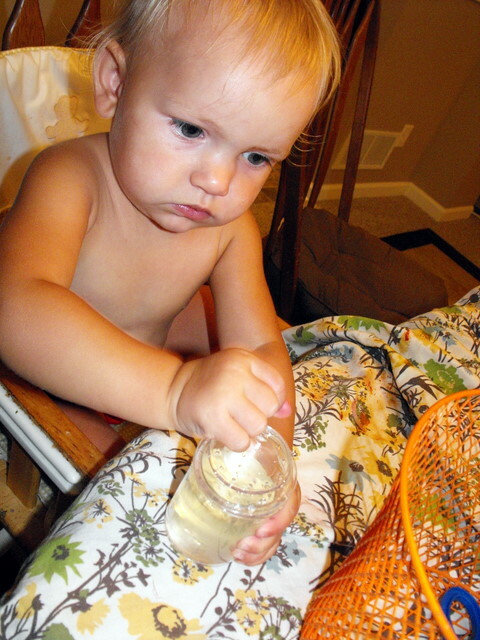 We then took two samples of the pond water in observation jars to bring into the house. In the house, we looked at the jars. The first jar didn’t seem to have anything living in it. The second jar, which was taken closer to the shore line of the pond, had several very tiny larvae that were very hard to see with the naked eye, and several larger pupae that were about the size of a grain of rice. The larvae tended to swim upright, with one end towards the top of the jar and one end towards the bottom, bobbing up and down. The larger pupae stayed in a fetal position with the tiny breathing tubes towards the top of the body arch. The pupae stayed at the surface for the most part, but if someone touched the observation jar, the pupae would dart straight down to the bottom of the jar and “convulse” by shaking the entire body back and forth. We haven’t done our formal “Outdoor Hour” challenge for the week, which is on mosquitoes, but we will hopefully be able to do that this weekend. The kids did explore their back yard this week and found an unexpected surprise! While Jedi was out looking for worms for his fire belly toads that he has as pets, he actually found a small toad in our yard. All three children thought it was really interesting to watch and all of them observed something interesting…. Jedi’s observation was that the toad was the same color as the dirt, and the toad was hopping around in the dirt. We got to talk about how some animals are small and vulnerable, and blending in to surroundings is one way to hide and protect itself from predators. Jedi also noticed that toads are very hard to catch, although he was very proud when he finally got to hold on to the toad. Monkey observed that the toad was small and was probably a very young. It was only about an inch long. She also noticed that the fire belly toad inside was brightly colored but this toad had no bright colors. In Ohio, the toads aren’t poisonous and tend to blend in with the dirt, so there is no need for bright colored “warnings” like the fire belly toad has. Bitty Bug observed the toad’s hopping and enjoyed following the toad. She would squeal with delight when she finally got close enough to touch it. 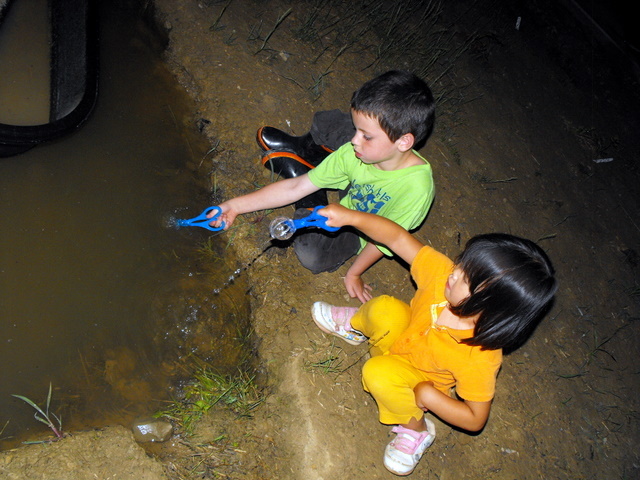 After all three children got to observe the toad, they let the toad go back to hopping around in the grass and noticed that it also liked to swim in the pond! I think I’m going to attempt to reorganize my postings. They seem all over the place! There are always things going on around here, so I either forget to post, or I remember to post but it’s about a lot of things all at once. There are also a couple fantastic blog carnivals out there that I want to get linked up with, so I’m going to try planning my posts around that. 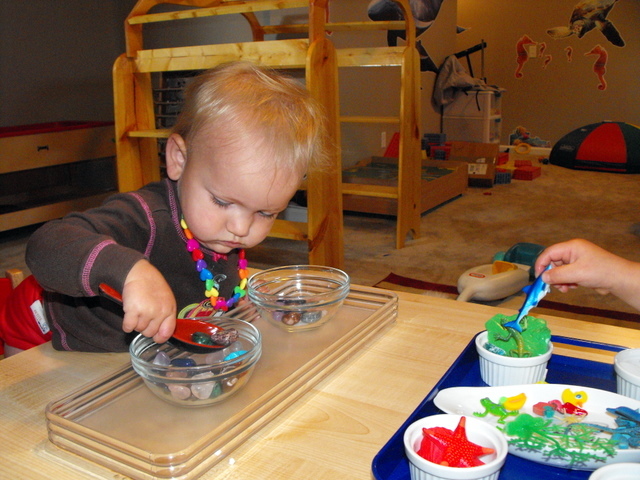 Montessori Monday is hosted by http://onehookwonder.blogspot.com/ . This will basically be an overview of the Montessori work that went on in the previous week, mainly by Monkey. The second blog carnival is Tot School. 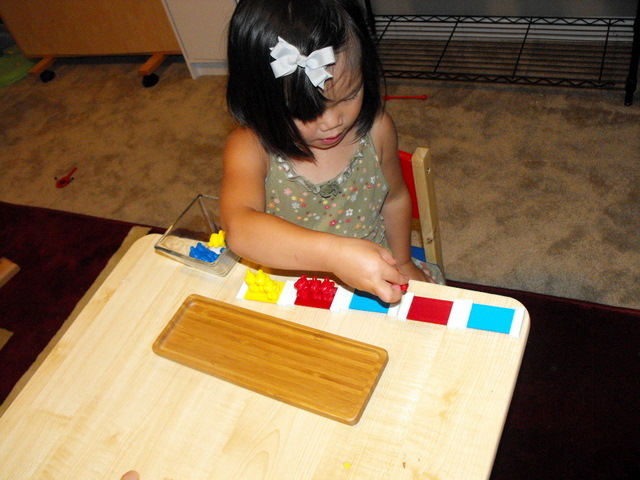 Tot School is hosted by Carisa at 1+1+1=1 http://lapbooksbycarisa.homestead.com/TotSchool.html. Tot School is a time set aside for children under 3 where you focus on playing with your tot, while “sneaking” some educational things in. It’s a fun time where they use their imagination, explore, create, and learn. 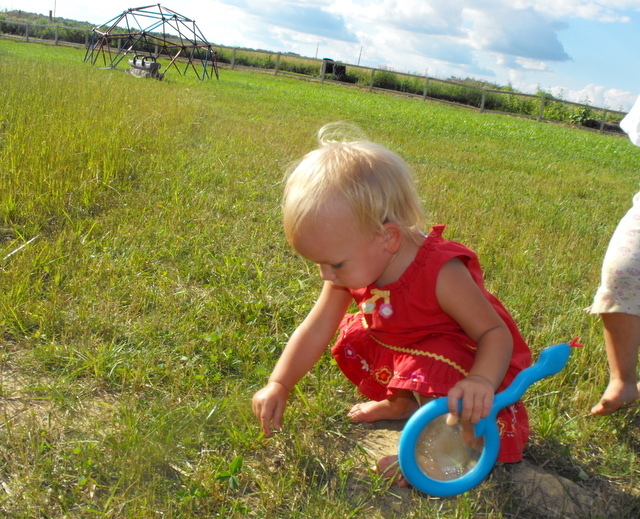 Of course, being a Montessori family, Bitty Bug’s Tot School time will also be Montessori in nature. 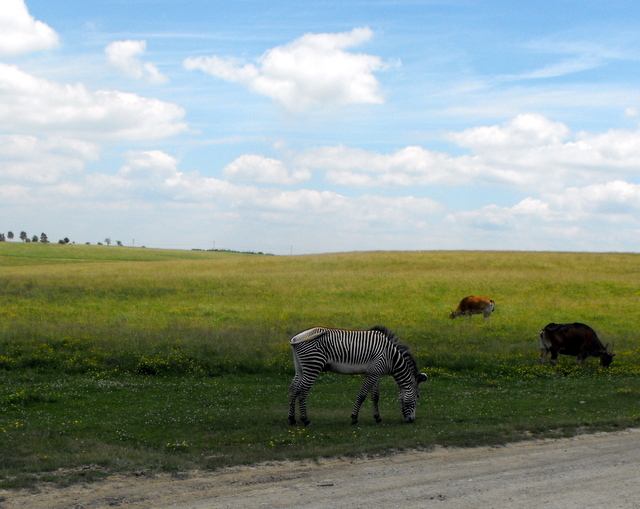 The third blog carnival is actually an outdoor nature challenge hosted by http://handbookofnaturestudy.blogspot.com . It’s based on the book “The Handbook of Nature Study” and involves studying the world in your own backyard, appreciating nature, and just exploring the world around you. This carnival has The Outdoor Hour Challenge. Of course, the randomness will still pop up every now and then, just because there are also people reading the blog that are reading for family updates. So, I’ll try to get that in here every now and then as well. Goodness, I apologize for the lack of posts. Things just got very busy around here, very fast. Jedi’s out of school for the summer and our days have been filled with almost daily field trips, some Montessori stuff (it’s awesome to have Jedi home during the days to work in the room with Monkey and Bitty Bug! ), and we’ve also been working a lot on landscaping. Honestly, that’s been taking up a huge amount of time–there’s only a small window of time during the year to do new plantings, and with a newly built house, landscaping becomes quite the task! I do plan on starting up posting again, at least a few times a week! We’ve been going on so many great trips and enjoying the outdoors, and it’d be nice to document those as well! In the past few weeks, the kids have pet flamingos at the zoo, came face to face with zebras and giraffes at a safari animal conservation center, went strawberry picking, visited farmer’s markets, and went to the lake (for swimming…but they also observed minnows and shells). 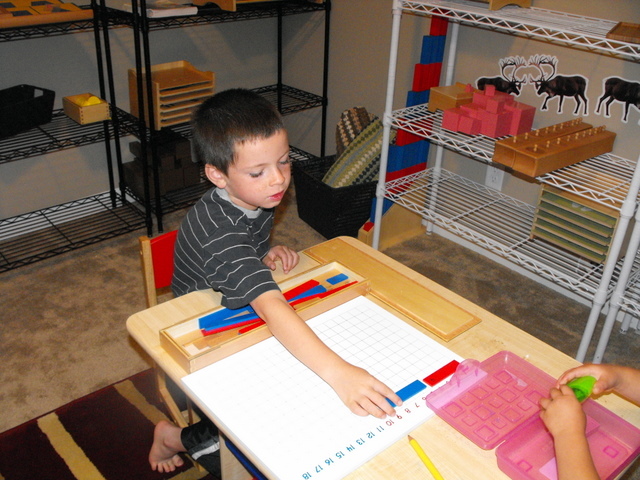 We’ve been doing quite a bit in the montessori room as well. One of the big things we’ve been trying to work on with Monkey is colors–she has a very hard time identifying the names of the colors, but she can sort them just fine. I’m not quite sure how to help her with this (she has some processing issues that make understanding words a bit difficult for her. She’s always had delays in speech & language because of her selective mutism and other special needs, and verbal processing is one of the last things she’s developing). 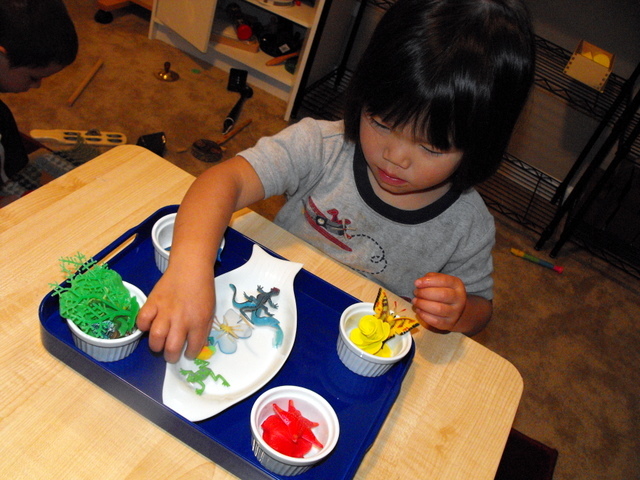 I did get her a “colors of nature” work where she sorts various animal figures and plant figures into the primary colors. She does pretty well with this (and Bitty Bug joined in…she hasn’t quite gotten it yet, but it’s interesting to watch her none-the-less. She definitely doesn’t sort, but she does carefully observe each piece–more on that in a second…). I do have to research some ideas on helping her get the names of the colors as well…three part nomenclature cards won’t quite work yet as she’s not ready for letter identification just yet. If there are other Montessorians out there who have worked with children who have processing issues, or if you have an idea for me, please do let me know! Back to Bitty Bug and her little things obsession. This child *loves* tiny things. She will pick up every rock, shell, piece of carpet fuzz, you name it. And then she will observe every single inch of it. It is really quite interesting to watch. She enjoys going to the lake for this very reason…there are so many tiny little pebbles and shells for her to pick up and observe. She definitely will have an eye for detail, that’s for sure!